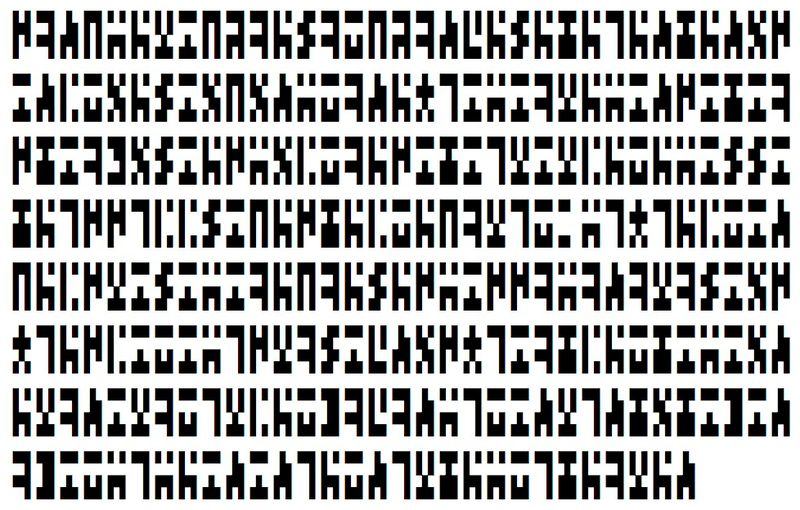 The image about is a puzzle, it’s a very basic exercise in cryptography. I thought some might enjoy the challenge of uncovering an authentically Catholic message for our times by solving a puzzle. While I can’t promise money or even fleeting worldwide fame. I will blog the name of the first person to post the correct answer along with the solution, in the comments section of this post – I will also tweet that they were the first to solve the puzzle from my Twitter account (@cc70458) where you can also follow the Catholic Husband. Happy decrypting! There comes a time in each of our lives when we must choose between being faithful to God, and being rejected or abandoned by those we once called friends. We must understand that we are not the ones making this decision – the people who would reject us for not jettisoning our faith to appease their conscience are walking away from us, we are not walking away from them. You see, it’s very hard for those enmeshed in darkness to tolerate the light of truth. Their dark lies are warm and comfortable, like a narcotic high – and just as seductively addictive. The bright light of truth is like a ray of sunshine in the eyes of a man recovering from a hangover. They will wince, and squirm, and even turn away. They will either to return to the bottle or sober up. When you shield that light by denying the example of Christ in confronting wrong then you deny Him. Think about it – every time you say the politically correct thing, rather than the faithful thing, you do nothing more than enable evil. People in darkness want it to feel normal, they want to feel approved of because they know in their hearts what they are doing is wrong. When you tell them what they are doing is not wrong, or that it is not your place to judge their actions (Not their person – Just the actions) then you are acting as an agent against God and helping them into perdition. If your child was reaching for a hot stove would you not warn them away out of love, would you not comfort them if they failed to heed your warnings and got burned touching the side of a hot stovetop? One thing you would never do is tell them that it was OK to endanger themselves in that way. You would not be judging the child, only their actions. Just as this very basic principle applies to your family, in order to live your faith you need to practice it with those outside your family who you care about. Our priests, and especially our Bishops have this sacred responsibility in a most solemn manner for all humanity – as they must serve as an example of heroic virtue to others – Pope Francis has continually done this despite the media spin doctors attempts to paint him otherwise. The internet can be befuddling for many Christians, too many voices all throbbing together in a confusing cacophony. However, just like in life – any real friend will accept you or reject you as you are. If you have to pretend to be something you are not, or to put your faith in check to avoid offending them; Well it is time for you to realize that they are NOT your friend. They are your captor, and you have just betrayed God for nothing more than the approval of a person stuck in the same tar pit you are. The person whose approval you need to worry about is God. He is the only person who can get you out of your predicament. However, you must reach out to him and accept his hand – just as they must do. To know what to do, they need to see your example of escape. They do not need to watch you drown in sin with them so that they can think that it is normal or OK to be swallowed up by the inky black tar and lost forever. Jesus did not instruct that we should be overly persistent in trying to bring them to the truth as evidence by the quote above which is repeated in Matthew 10:14 and Acts 13:51. That said, Jesus also gave us from his personal example that we were not to let wrongs go unchallenged. He did not tell the adulteress that it was her body to do with as she pleased, he did not tell the money changers he respected their choices, and he most certainly did not tell his followers to keep on in their immoral ways and do what thou wilt. He offered mercy to the repentant, remember what he told the adulteress – “Go forth and sin no more”. Yet we have done so in our society, in the misguided sense that we can coexist with those who violate God’s law without upsetting them by calling out sin. Our children have fallen away from the churches because they hear our words, but they do not see any real conviction in our actions. In fact they see the opposite – and instead of 30 pieces of silver, we sell out our faith for the approval of others. We invite unrepentant perpetrators of evil actions into our lives and act surprised when it is we who are corrupted by allowing ourselves to tell the lie that “it does not really matter” so many times we make others and ourselves believe it. We are always called to love the sinner, but also to rebuke the sin. This is one of the Church’s hardest teachings. Hold firm to Church Doctrine. Pray for guidance. Love and know that it may never be returned. Accept that you will be scorned and rejected for doing so, but also know that you are following in His footsteps – and that means that you are surely on the right path. St. Michael the Archangel, Pray for us all. Kathryn’s latest status is below – I understand first hand just how much those cards, letters, and notes can mean. This is a child facing immense physical suffering, and a family faced with watching the child suffer and potentially die. The anguish for both parties is beyond description. It is a time when people feel helpless, afraid, and crushing grief at both the suffering and their inability to alleviate it. If you have a moment – please do send a card, if you have a minute write her a short note, and in you have a few minutes please write her a letter. You might also send a card or note to the whole family – letting them know that others care deeply about what is happening to them and offering what compassion and prayer that we can. No matter what the outcome, the most important things are to make sure that Katheryn feels loved and cared about, and that the family never forgets they are loved and not just held in the bosom of God – but by the arms of the Body of Christ. That last one means you and me. A lot of you have asked to be called if we need your help in anyway! HERE IS WHAT WE NEED FROM ALL OF YOU!! Please do not count on someone else doing it! Kathryn and her mom Kathy arrived at the hospital this morning for her chemo treatment. Over the weekend she developed a cold and so was placed in a small isolation room for her treatment. Her Ferritin level last week had risen to 3200, they are down to 1800 but it is because she is back on the steroids. Because HLH is so rare, it is very difficult to treat and doctors are having to come up with different ways to attack it. The family has asked you to join them in praying for her doctors that they will think “out of the box”. Today they were told she will be started on 2 new medicines. The first she will start today. The doctor told Kathy the pharmacy may have to order it since most pharmacies don’t keep it in stock. But as soon as they get it, Kathryn should start it immediately. The second medicine is extremely expensive and has never been approved for HLH patients. The doctors have contacted the insurance company for approval. The way Kathy explained it was that it is a spectrum disorder with many different levels that range from juvenile onset arthritis to MAS to HLH (roughly).The second medicine has been approved for MAS patients and Kathryn’s doctors are hoping that she will get the approval since HLH is in the spectrum of the disorder. It will take 2 weeks to get the approval. Another blow today was that they found sugar in her urine and it”s most likely steroid induced diabetes. She will have to start a strict diet and possibly even insulin. Those of you who are bringing dinners, please take this into account and prepare meals accordingly. Doctors also officially requested approval from the insurance company to have all 4 of the Gardner girls tested by a simple DNA mouth swab. This is the first of several steps in preparation, should Kathryn need a bone marrow transplant in the future. Kathy says they are emotionally spent and feel like they hit a wall today with this new information. We must not stop praying. 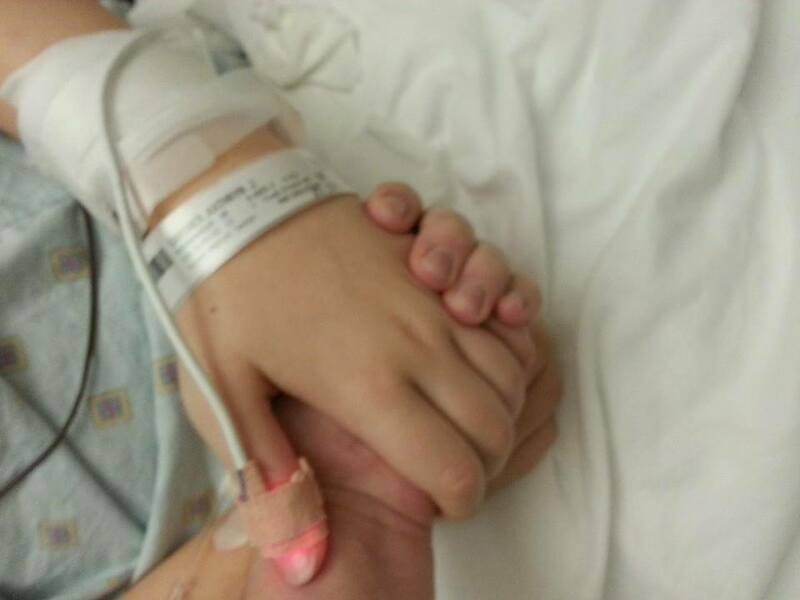 Kathryn did not receive this horrific diagnosis alone, the whole family is affected by it. In many ways that we can’t even imagine, they are all suffering. Let’s lift them up daily, all of them. Kyle, Kathy, Kassidy, Brayden, Kathryn, Kymberly, Kristine and Karlie. This beautiful family needs our prayers. As I write this, we are facing another winter freeze. Many of us will honker down for the next couple of days. If you haven’t done so yet, take some time to write them a letter. Have the kids draw a picture or jot a note. It will let Kathryn and her family know they are not alone, we are all here for them. My beloved wife came across this article on Facebook, and had no trouble expressing her feelings about it. I’m quoting her here straight from her facebook post with her permission. Like and share if you agree with her. In the meantime, I’ll be praying for the author of the article with her. Indeed I do feel I am just as well off as “women who take care of themselves.” I left a successful career to stay home and raise my children because I believe it is the most important thing I could be doing with my time right now. There is no reason why I cannot resume my career later or even start an entirely new one when the time comes. I am more than capable of thinking, choosing, and taking care of myself, thank you. I simply don’t measure success by money, affluence, or influence alone. I can think of no greater contribution to make of my life than raising my children to be independent, well educated, responsible adults of good character. This is a woman filled with anger and bitterness, and I simply refuse to live my life that way. She has every right to make her own choices. She has no right to make mine. PS: If you’d like to hear more from my wife – leave a comment and let her know. This is not getting any press attention in our own media. While we are obsessed with Justin Bieber’s latest escapade, people are dying. 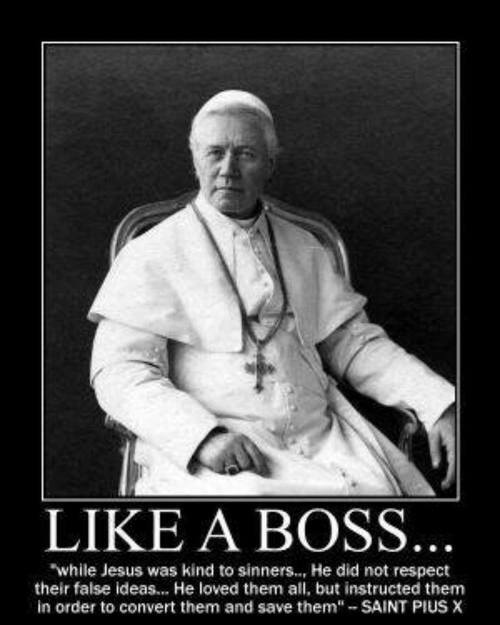 The situation is dire and is sparking displays of heroism by both Catholic clergy and the laity. When you see the picture of the priests standing between the armed soldiers and protesters praying, remember that these are priests who are acting with heroic virtue. They deserve our prayers of support and our admiration. Take a moment to pray for the priests and the people of Ukraine during this time of turmoil. Click any picture on this page to take you to the source and relevant article for it’s original poster. Please take a moment to read some of the articles. 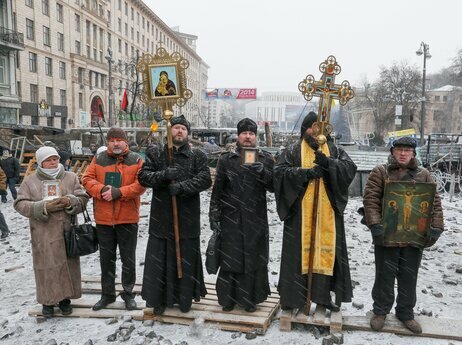 Ukrainian priests stand between protesters and riot police during an anti-government protest Monday in Kiev. 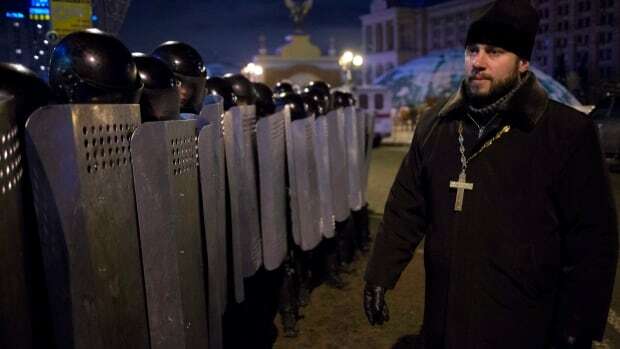 An Ukrainian priest speaks to riot police as they block Pro-European Union activists camping out in their tents on the Independence Square in Kyiv, Ukraine, on Dec. 11, 2013. If you are like me you are probably stuck watching the March for Life on television. Like me you can’t go for any variety of legitimate reasons, but you want to support not just those marching, but all those who work tirelessly year round in their endeavors to protect life, support adoption, and provide assistance for unwed mothers and mothers-to-be. Some friends who were at the March for Life sent us back that these guys were there, with a great idea (as well as some cool pictures!). For every bag of coffee you buy, you send one dollar ot the pro-life ministry of your choice. This is not just a “Catholic Thing” – you can contribute to any bona-fide pro-life cause and target the donation! I ordered a 1lb bag of their espresso blend whole beans. As a sailor who loves all things nautical – their logo sung to me. Their cause sung to me. Then of course they were offering me a chance to buy something I needed for my wife’s new espresso maker and support the pro-life movement of our choice at the same time. It’s neat in that the coffee is reasonably priced, the shipping was VERY reasonable ($2.99 for my order), and after it gets here I’ll ask my wife if it was any good. As I was a US Navy sailor my affinity for coffee was driven by need more than aesthetic pleasantries – so my palate is shot. However, I know that nowhere else have I found that I could support a just cause and even direct my donations to particular groups of my choice. Just give them a group and phone number so they can get them added and pay them, or pick from a list of affiliates they already have. I’m really impressed and me being impressed enough to do a shameless plug does not happen often. Think what kind of impact a Catholic owned , or simply Pro-Life owned, business could make by switching over to them for your beans? DISCLAIMER: I was not in any way solicited by anyone to post this – I did it because I felt moved by the spirit to do so. I received NOTHING free or DISCOUNTED for doing so, nor was I promised anything. That’s just not how I do things. The link is a direct one just to their main page. I would encourage you to share this with anyone else who might be interested. Support the Pro-Life movement-year round buying something you need at a great price. Note: If you don’t like coffee per say you buy a bag of espresso beans from them, a bag or two of Hershey’s special dark chocolate chips – melt the chips, dip the beans, cool on waxed paper, and enjoy very sparingly. They can be eye opening fun at parties.